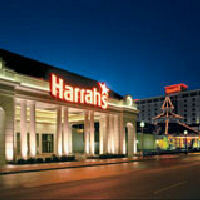 List of reviews to help you locate and learn about the ten Illinois casinos and five racetracks. 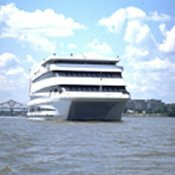 The 10 gambling facilities are technically river boat casinos, but they never leave land. The trend for Illinois casinos is to mimic large land based facilities and some now boast over 65,000 square feet of floor space. 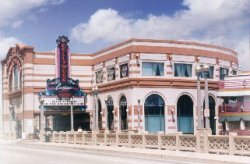 The three most popular Illinois Casinos are Hollywood Hotel near Aurora, Hollywood Hotel near Joliet and Jumer's Hotel near Rock Island. The Rivers Casino in Des Plaines is the largest and newest casino. All offer the typical Las Vegas games like slots, baccarat, blackjack, poker, craps, roulette and other table games.. The minimum age to gamble is 21. 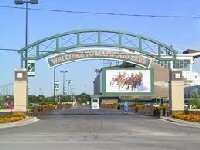 Illinois also has five horse racing tracks, which offer betting on live races and simulcast, but no slot machines or table games. The link to Casinos near Chicago includes places to gamble in both Illinois and Indiana. Chicago is a must see, but there are other interesting and exciting places to visit. Lots of history from Frank Lloyd Wright architecture, light houses, to Lincoln’s birth place or you can visit a winery to for a taste of the grape. From top to bottom the state is a real joy. Click on an Illinois casino name in the matrix and find out if they offer stay and play golf packages or RV camping. 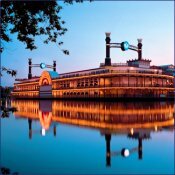 Visit the official Illinois tourism web site www.enjoyillinois.com for more travel information. 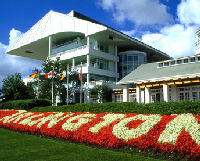 Arlington Alington Heights Arlington Racetrack has live quarter horse races on two tracks. The race schedule is May-September 11am-7pm and Arlington has six restaurants. Fairmount Park Collinsville Fairmount Park Racetrack has a one mile dirt track with live thoroughbred racing Monday-Thursday 10am-11pm and Friday-Saturday 10am-12;30am. Fairmount Park is located in Collinsville, Illinois. Balmoral Park Crete Balmoral Park Racetrack has a one mile track featuring harness and thoroughbred racing daily from 11am to close. Balmoral Park is located in Crete, Illinois and has two restaurants. Maywood Park Melrose Park Maywood Park Racetrack located in Melrose Park, Illinois has a half mile track featuring harness racing daily from 11am to midnight. Hawthorne Stickney Hawthorne Race Course is a one mile track with quarter horse and thoroughbred races daily from 11:25am to close. 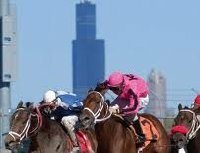 Hawthorne Race Course is located in Stickney, Illinois and has one restaurant.